Antibiotics in pig feed are increasing antibiotic resistant genes in pigs. Photo courtesy of MSU. Antibiotics in pig feed increased the number of antibiotic resistant genes in gastrointestinal microbes in pigs, according to a study conducted by Michigan State University and the U.S. Department of Agricultures Agricultural Research Service. Published in the current edition of the Proceedings of the National Academy of Sciences, the comprehensive study focused on understanding the effects of conventional, in-feed antibiotics in U.S. farms. Scientists dont know precisely how antibiotics enhance growth rates and feed efficiency, but they are concerned that on-farm use of these medications may contribute to the development of strains of microbes resistant to conventional antibiotics, which are potentially harmful to humans and animals, said James Tiedje, MSU University Distinguished Professor of microbiology and molecular genetics and of crop and soil sciences. • Both diversity and abundance of antibiotic resistance genes increased in the intestinal microbial communities of the pigs treated with antibiotics. Longer term studies are needed. 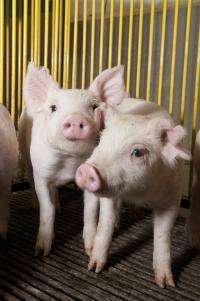 • Some of the genes found in the treated pigs were unexpected and usually linked to antibiotics not used in the study. • Microbial genes associated with production and use of energy by microbes increased in abundance in the antibiotic-fed pigs, which may shed light on how antibiotics increase livestock growth and feed efficiency. • E. coli populations increased in the intestines of the treated pigs. Further study is needed to clarify this observation. To our knowledge, this study is the first of its kind to look at the collateral impacts of in-feed antibiotic use in farm animals, using a comprehensive approach to detect shifts in the function and the makeup or membership of the microbial community in the model animals gastrointestinal tract, said Torey Looft, USDA researcher. Additional MSU researchers included Tim Johnson, doctoral student; Robert Stedtfeld, civil and environmental engineering research associate; Woo Jun Sul, doctoral student; Tiffany Stedtfeld, civil and environmental engineering technical aide; Benli Chai, information technologist, Center for Microbial Ecology; James Cole, assistant professor at the Center for Microbial Ecology; and Syed Hashsham, civil and environmental engineering professor. Household bugs -- a risk to human health? is any of this new ?, I thought this has been known for 50 years.